When we consider a spirituality of work, we also need to consider others' work and how we ensure that members of our society are not mistreated. What rights do you believe everyone should have regarding work? Does everyone deserve a job? A living wage? What is a living wage? Etc. What responsibility do we have to make these beliefs a reality? The focus for this week connects with the following chapters in the small group process and book by Gregory F. Augustine Pierce, both available for purchase from us at The Pastoral Center. The Gospel story is the parable of the tenants, where the landowner's servants and son are murdered by the tenants. This offers an entry point for considering the treatment of workers everywhere. The story can serve as a reminder that Jesus is present in workers, especially the "least of these." How do we work for God's kingdom and the good of all? See the overview above for ways to develop this topic. 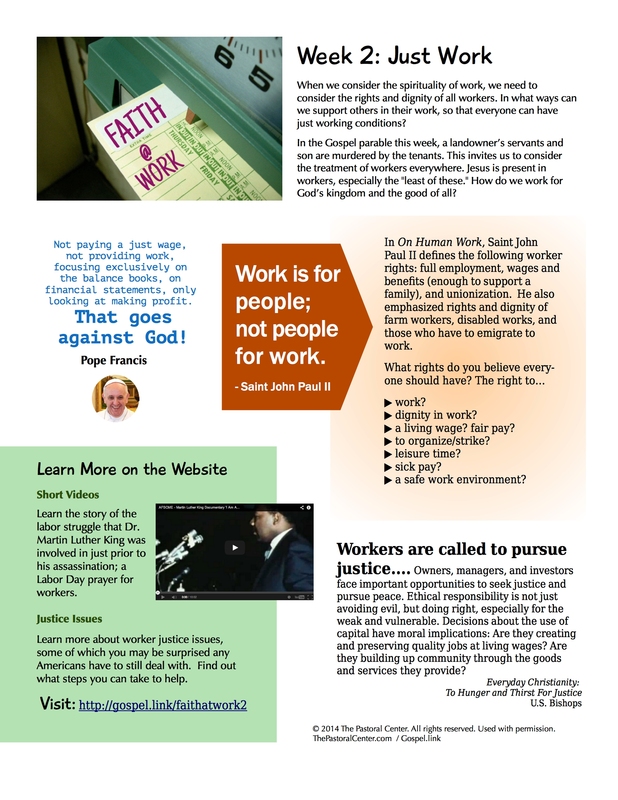 Click the button to the right to download an excellent bulletin insert from Interfaith Worker Justice about raising the minimum wage. It includes a prayer for a living wage, facts, and recommended steps. Interfaith Worker Justice also offers a full toolkit for Catholic parishes to integrate respect for labor justice through a Labor Day (or any other weekend) liturgy.